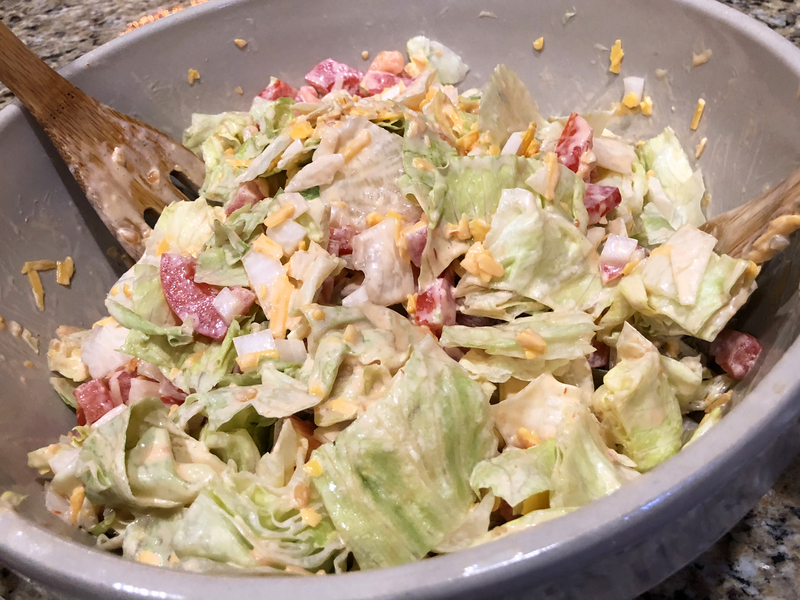 I’m not sure who coined the phrase atop this recipe but after enjoying this hearty salad I discovered it to be quite true! 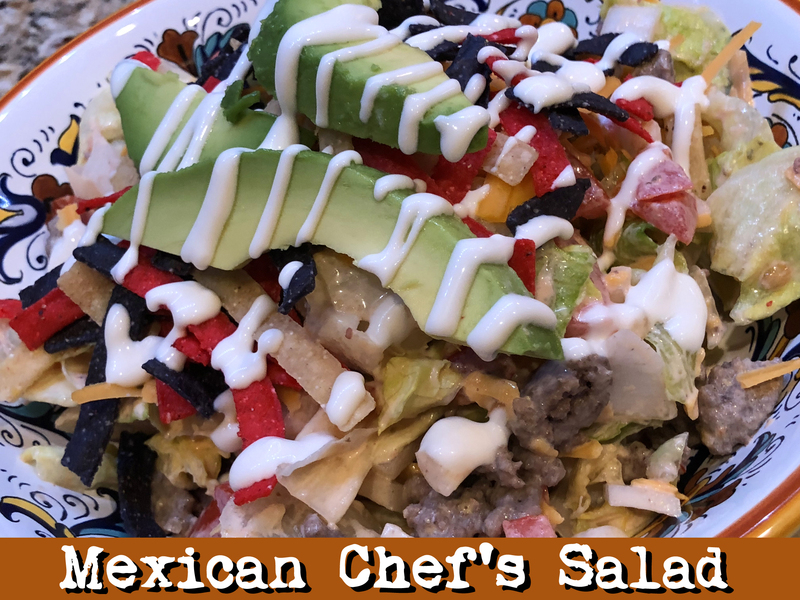 Even more surprising – this Mexican Chef’s Salad calls for Thousand Island (with Canadian roots) or French Dressing (um, with American roots?) – hey where’s the south of the border taste with those? The mere mention of Thousand Island dressing takes my laughs back to the 1980s with this memorable scene from the movie “Cracked Up” where Jerry Lewis’ character gets a little more service than he bargained for thanks to this rigorously exhaustive waitress! Despite my salad sign as a Leo, fate had a fresh bottle of Thousand Island dressing in my hands so that’s what I used. What’s your salad sign? ❤ I’ve included Mom’s original recipe scan below. I enjoyed the way the ingredients were organized (chop, toss, crunch, slice, brown, decorate) but I’ve taken liberties to put the typed instructions in order to help make it easy for you to prepare. ❤ Red, white, or yellow onion – it’s all up to you! If you prefer your onion cooked you can add it to the beef medley when browning; otherwise get ready for a little “oompf” from the uncooked fresh onion kick, as did I. 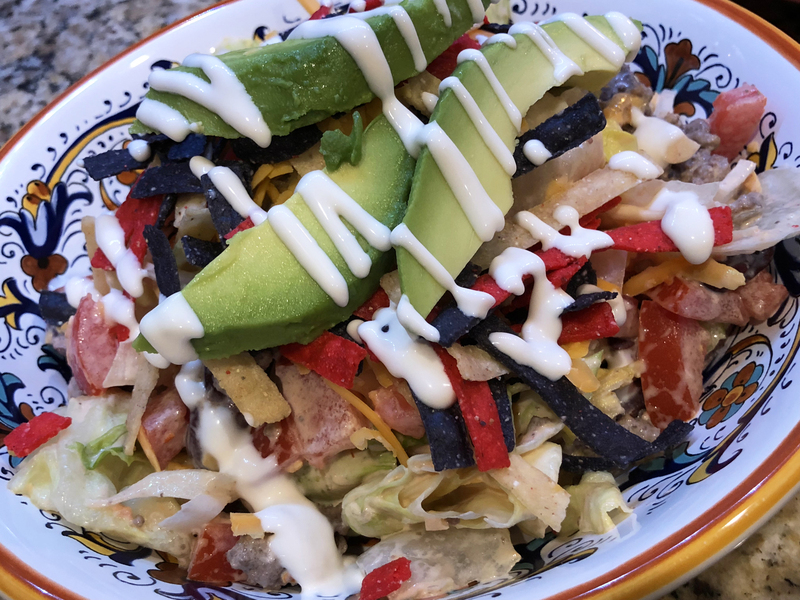 ❤ While I’m 99% confident that Mom used tortilla chips for this dish I went with tortilla strips – their multi-colors are more festive than their typical chip cousin plus they’re easier to eat with a fork! Tip: HEB makes tasty Tri Color Tortilla Strips that I stock in my kitchen. Now if you’re eating this dish with your hands, step up to the plate (or bowl) and get some full-sized tortilla chips … or better yet a bag of Fritos Scoops! ❤ This recipe makes A LOT of salad. I believe in its entirety this dish will serve up to 6 as a main course and even more as a sidekick! You can easily half the ingredients for 2-3 people. ❤ Make sure and introduce your tortilla chips (strips), avocado, and tomatoes just before serving; nobody likes a limp tortilla chip, brown avocado or mushy tomato! As you would guess it this dish is best consumed fresh as with leftovers the dressing will make your lettuce turn sad and soggy. Why yes! 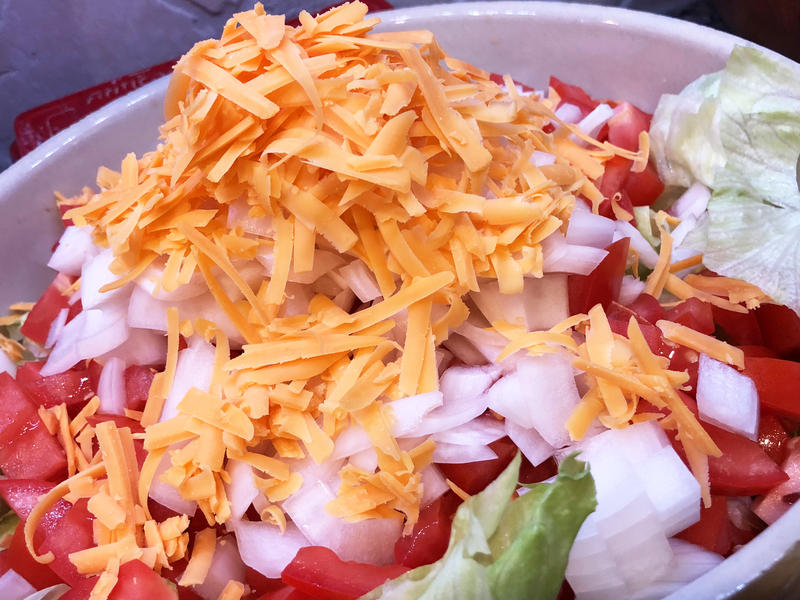 I do like my salad with cheese and a side of lettuce! 3. Give one last mix to stir things up a bit… then toss in your beef mixture, top with cheese, chips, and your avocado. Serve pronto! 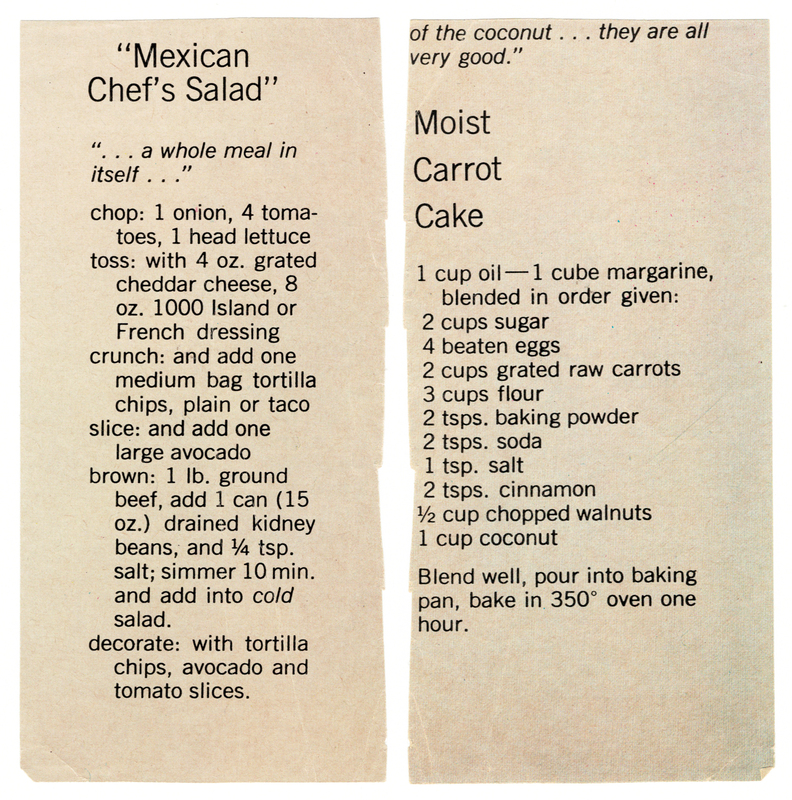 A Scan Of Mom’s Original Recipe PLUS a Bonus Recipe Found On The Back… For Moist Carrot Cake! 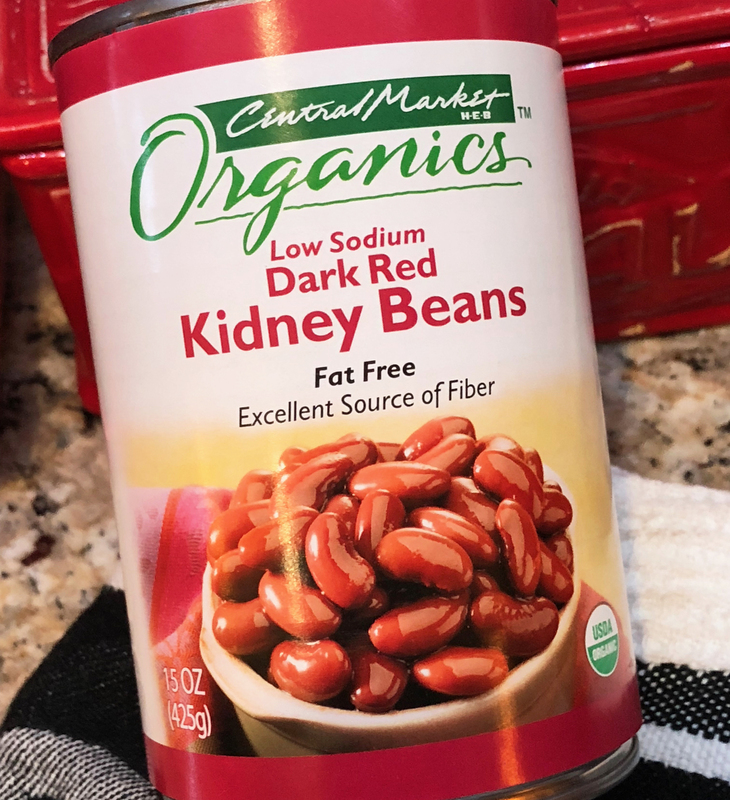 One of the interesting things about being a self-proclaimed nostalgic food blogger is when I run across food items that are no longer available. Looking for something that isn’t there can turn me into an angry shopper at times but I often find a workaround, like when I made my own madrilène for what I thought was going to be a simple bowl of cold avocado soup. In just a single lifetime serving sizes have become larger and in tandem food is sold in larger sized containers. Supersize Me. As is the case with this recipe, “Tasteez Fried Chow Mein” is no more. I can’t even find a trace of it performing one of my usually successful Google image searches! So that means it was likely gone way pre-pre-Internet. Like many of my other posts, I will give you a taste of what it was like back in the good ol’ days with some vintage chow mein commercials, albeit from other brands like La Choy, which seems to have survived the taste test of time. After you’re done with the recipe, scroll down below where I’ve curated some of my favorite videos from YouTube. 享受! (that’s “enjoy” in Chinese). ❤ I wasn’t very familiar with what “dry onions” were. Maybe something was lost in translation so I used Spice Islands Dry Minced Onions, which was all I could find at my neighborhood store. I think I got this correct! ❤ A word about parsley: While my Mom “Betty” would likely have used curly-leaf parsley, I’ve learned through the years that it’s a little too tickly for my tongue. I’m usually hugging tight to the Italian flat-leaf parsley because I don’t find it wrestling my tastebuds on the way down. 1. 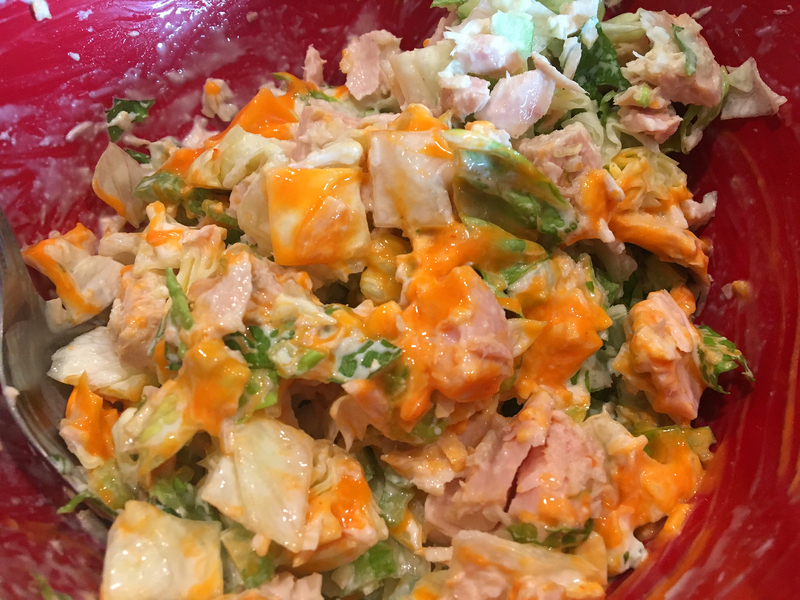 Mix tuna, celery, dry onions, and lettuce. 2. Stir in the mayo and the French dressing. 3. The recipe doesn’t call for it, but here is where you could chill your tuna salad (totally optional). 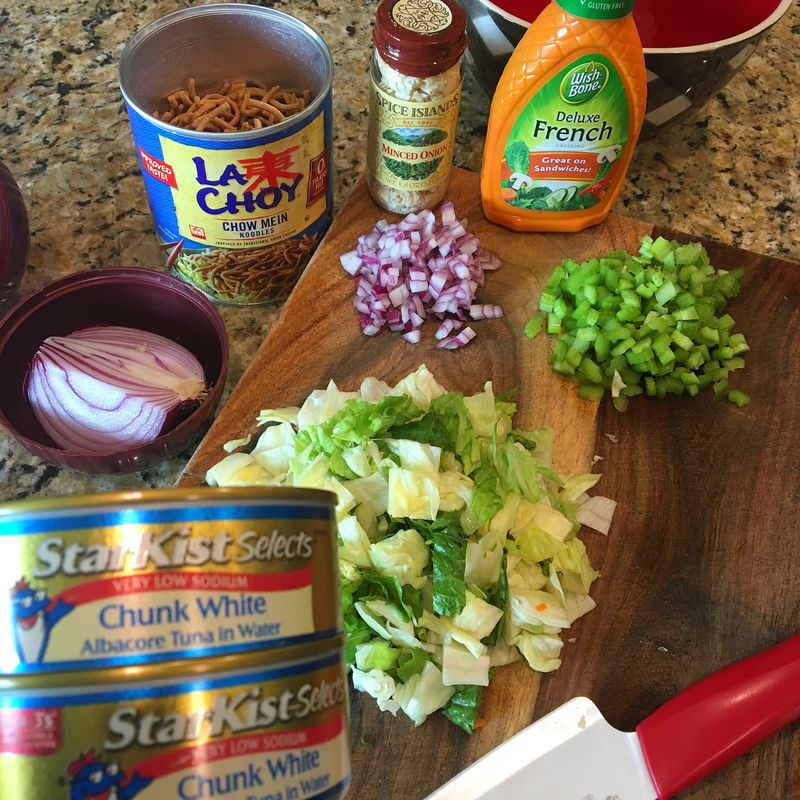 When ready to serve add the chow mein to the salad mixture and stir to coat. 4. Arrange the tuna salad on your lettuce leaf and garnish with parsley. 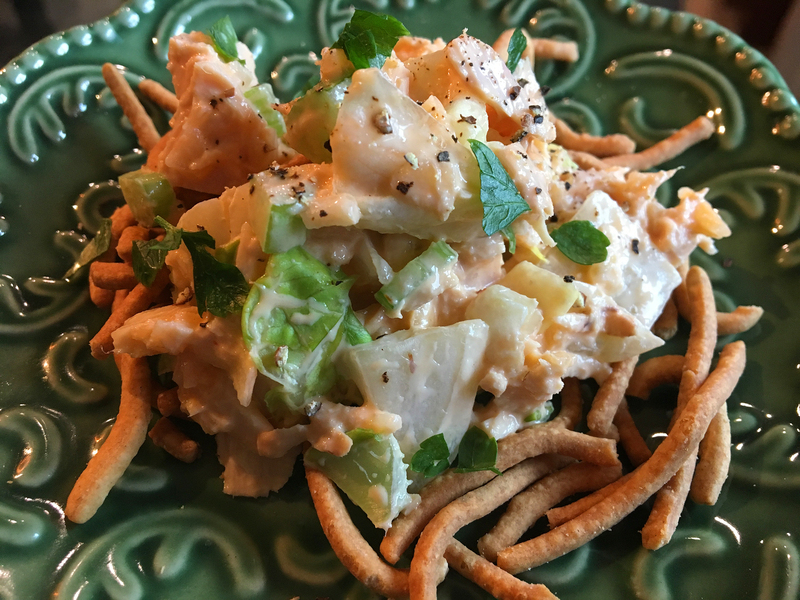 A scan of Mom’s Crunchy Tuna Salad recipe. This recipe is on a waxy kinda paper – likely a cutting from the Tasteez chow mein package itself! Now on to the vintage videos!